Q80. What are the pros and cons of children spending a lot of time to practice and train for sports? Support 1: The pros include the learning of strong values and the healthy development of the body. Thesis:The pros Include learning about teamwork and fair play while exercising for a healthier body. The cons include the possibility of injury, the overbearing nature of parents who want their kids to Win, and the deflection of attention from their studies. The pros of children practicing and training sports is that it teaches them the value of teamwork, fair play, and it helps them get out and exercise. The cons include that too much could cause injury and that obsession with sports could cause their parents to push them too hard and it may even affect their school work. Here’s a more detailed explanation. The pros include the learning of strong values and the healthy development of the body. One value that sports teaches is the value of teamwork, where people learn to work together towards a common goal. It also teaches them the values of honesty and faIrness, where everyone follows the rules and doesn’t cheat to get ahead. And it encourages kids to get out and exercise for a good amount of time, something that concerns parents tn relation to their children’s health and development. These are all positive traits that sports can bring out in kids. However, the teaching of sports and over practice of them could prove to be detrimental to children in the following ways. First off, if pushed too hard or if there’s an unforeseen mishap, the child could experience a rather serious injury. This could seriously jeopardize the physical or mental development of the child. Parents could also negatively affect children by pushing them to wtn and succeed, often to the point where they feel so much stress that they no longer want to participate. And this preoccupation with sports could negatively affect their school performance by distracting them and pulling concentration away frr.mn their school work. So a balance needs to be found. 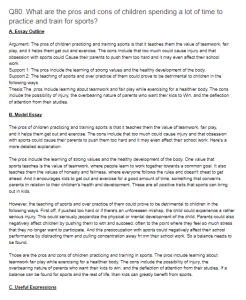 Those are the pros and cons of children practicing and training in sports. The pros include learning aboutteamwork fair play while exercising for a healthier body. The cons include the possibility of injury, the overbearing nature of parents who want their kids to win, and the deflection of attention from their studies. If a balance can be found for sports and the rest of life, than kids can greatly benefit from sports.